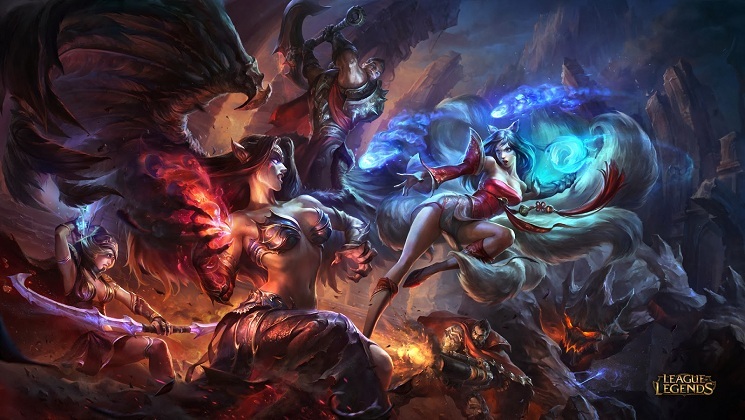 Here is your Season 5 guide to League of Legends! Hello summoners! Chances that if you’re here is because that you want to learn or brush up on some League of Legends. Season 5 has a lot of new things including the new Summoner’s Rift and jungle items. I covered all the basics for you. This page links to every part of the guide that I’ve released over the past weeks so feel free to check out whatever topic you’d like! Good luck on the Fields of Justice! The guide for the Solo Top! Learn how to tank and engage the enemy team in fights! Learn how to push, farm and harass – Unlike bottom lane, you do not have a support. Top lane isn’t as mechanically intense since you’ll be focusing on farming. However, like mid lane, you’ll have to include dealing with harass, harassing the enemy laner and learning when to go for a kill in the laning phase without dying given the enemy laner’s crowd control, cooldowns, damage, and if you’ll have to dive enemy tower if diving. All while paying attention to if the enemy jungler is around; this is vital because the top lane stretches in an arc so if you cross the river, you’re essentially committing to what you crossed the river for. So top lane, like mid lane, is more about variables to consider then mechanics (although you’ll need those to play well in lane) and a sixth sense (and ward coverage) of the enemy jungler when crossing the river. Note that I am not a pro top laner, just giving some general guidelines that new players need. Skirmishing Sabre – This item used with Smite is primarily for winning 1v1s in the top lane. Secondary use is to steal enemy jungle camps and to secure objectives. Primarily used on champions like Hecarim and Shyvana. Thornmail – An item that helps versus Attack damage champions and returns some of the basic attack damage done to you. Warmog’s Armor – A good item for increased health and great health regen. Sunfire Cape – An item that helps with surrounding yourself with magic damage which is great for in-your-face champions. Banshee’s Veil – Provides magic resist and it’s spell shield blocks an ability which could be a stun or a snare that could start an unwanted fight. Trinity Force – Gives the champion… tons of damage. In seriousness it’s great for top lane carries. Randuin’s Omen – Provides armor and health and a great active AoE slow. Spirit Visage – Great for increasing the potency from all sources of healing. Frozen Heart – Many helpful for dealing with attack speed champions but also provide good armor and cooldown. Guardian Angel – Greta item that gives magic resist and armor plus revive on death. Summoner Skills that I generally use are Flash and Teleport to stay safe and for surprise ganks or to join team fights respectively. Sometimes I’ll use Exhaust or Ignite if it fits the lane situation or the team composition. Sometimes Ghost is good option. Smite if you’re using Skirmishing Sabre. The generic top lane is usually a tanky bruiser type. 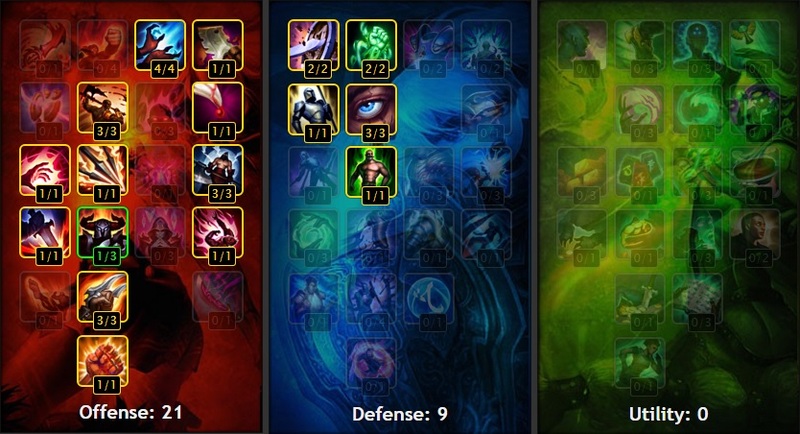 If you want to go for a more damage oriented route, again, check out my Solo Mid guide which has stuff for both magic and attack damage types of champions. Feel free to use those as a base in order to make your own Solo Top setups that you feel comfortable with. 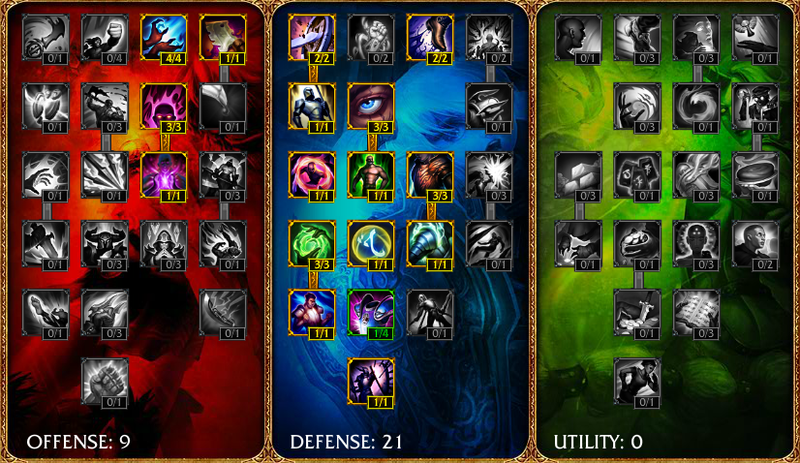 If you take a carry to the top lane, you want to focus more in the offense tree so 21/9/0 is the ticket. 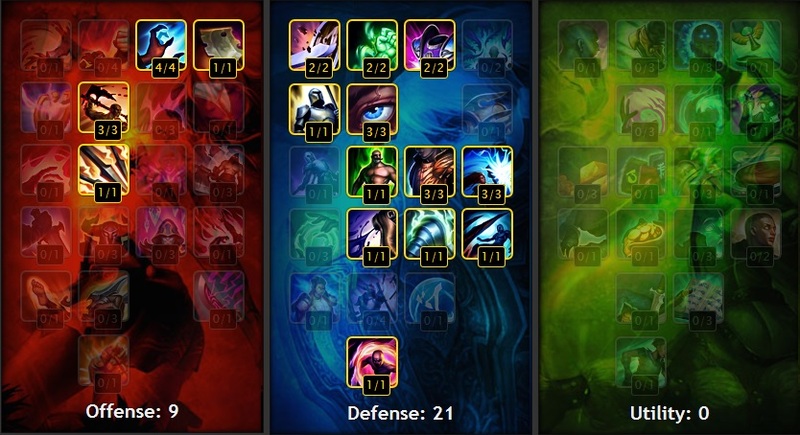 Masteries 9/21/0 focus on damage in the offensive tree and massive defense the defense tree. Runes are for damage (x9 Damage Marks, x1 Damage Quint, x2 Attack Speed Quints) and defense (x4 Flat Armor Seals, x5 Scaling Armor Seals, x9 Scaling Magic Resists Glyphs). Some other options for tank stats is that you can swap some of the armor seals for flat health or scaling heath seals and the Attack damage Quint for a flat Health quint. 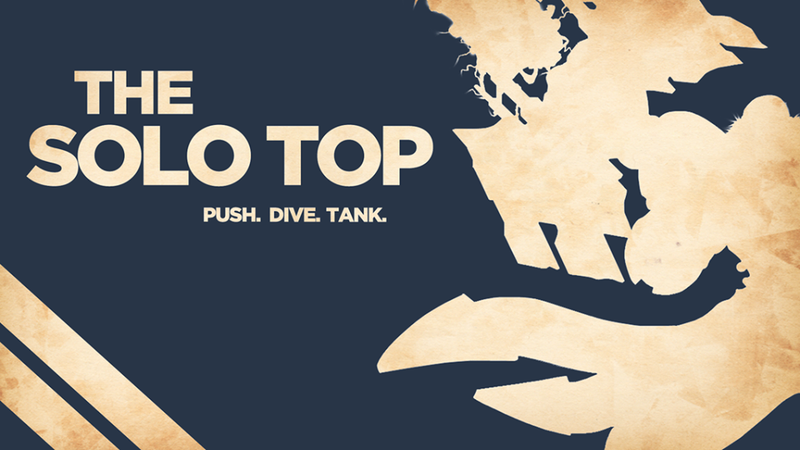 In the early stages of the game, the Solo Top is like an island. It’s just you and the enemy laner where the junglers come to visit every now and then. Like the solo mid, solo top trys to 1) farm, 2) harass whenever in your favor and 3) take out the enemy laner whenever possible. The greatest advantage a solo top can get is by farming in the middle of the lane. When you have accumulated enough money, you’ll want to clear out the enemy minions wave as soon as possible in order to have the minion wave push out the enemy tower. This way, the enemy laner is forced to farm underneath their tower while you can go back to base to buy items and return to lane and the minion waves should be essentially balanced to the center of the lane or may more towards your side of the lane if the enemy laner keeps pushing. Of course take out the enemy laner if possible. At the same time, do not get baited. You can get easily killed if you go too far out into the lane. Once you’ve cross to the enemy’s side of the river, you don’t have your jungler to support you and you don’t know where the enemy jungler is or if someone in the other lanes are missing, you essentially taking a risk at that point. Be sure to place at least a ward in the river and if possible your side of the lane brush. To be completely safe, use 2 wards. One for the enemy jungler’s likely entrance to gank you and one for the river or lane brush. Do I have enough health? Do I have enough mana? Do I have my skills off cooldown? Do I have an out? Where is the enemy team at the moment? Do I have a minions wave when I’m diving? How many turret shots can I take? Can anyone follow me up? Essentially you can’t dive a champion if you’re low on health and mana or are missing vital skills needed to dive successfully. You’ll also may need an exit strategy if the dive fails and you’ll also need to make sure that the enemy team isn’t nearby if it’s a gank to ruin the dive and get a kill off of you. If diving a turret, making sure you can survive the hits from the turret. Having a minion wave taking the turret hits while you dive will increase the odds of a kill since the turret will only focus on you when you actually land a hit on the enemy champion. Having your jungler or mid laner come help out during the laning phase also increases the chances of a kill. Diving an enemy team should be done when you take advantage of a mistake they made or if you’re engaging by surprise. 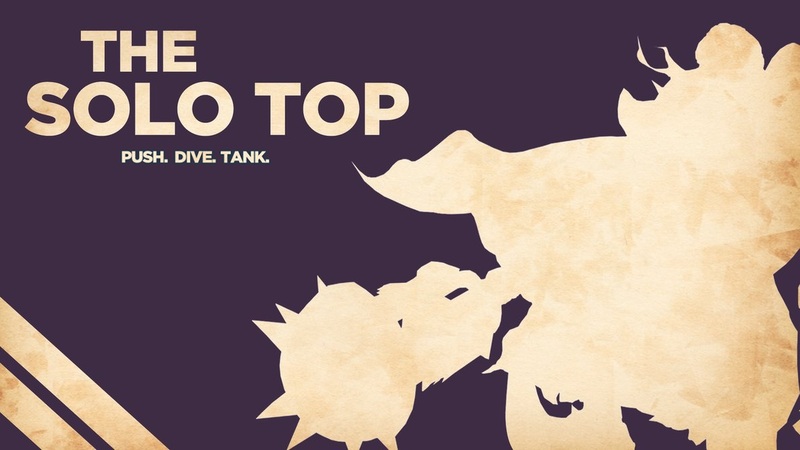 In team fights, if you’re tanky you are the front line. You may have your jungler or support (if they’re tanky) helping you out. You’re the one who soaks up damage while dishing out damage to the front line while you’re team deals damage to the front and back as much as possible. The goal of this is to make the enemy team waste their good skills on you so that they’re on cooldown while your team uses their skills on high priority targets. When the enemy team thins out a bit or if you get the chance, you can go for the high priority targets to take out provided your teammates will be ok versus the enemy front line. You might die given you’re in front but if you’re protecting your teammates will dishing out damage or just being an annoyance, then your team will usually come out on top. What I like to do is initiate on the team then immediately try to jump onto a carry and hammer away at them. This forces the whole enemy team’s attention and focus fire on me while my team does damage. So those are the general guidelines on how to play as a Solo Top. Essentially you are the vanguard. If the enemy team finds you’re scary to get past by, you’re doing your job. As always, feel free to comment below if you have anything to say about the guide. Have fun on the Fields of Justice! 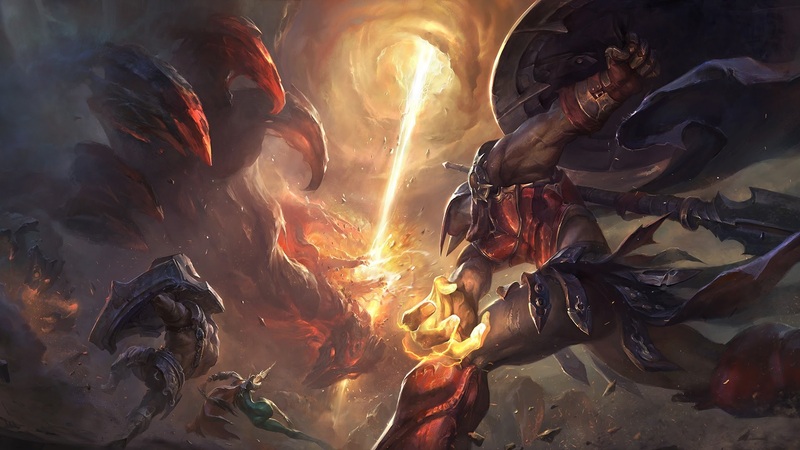 Here is your Season 4 guide to League of Legends basics! Hello summoners! Chances that you here is that you want to learn or brush up on League of Legends. With Season 4 comes a bunch of changes and I’ve covered all the basics for you. This page links to every part of the guide so feel free to check out whatever topic you’d like! Good luck on the Fields of Justice! The guide for the Solo Top. 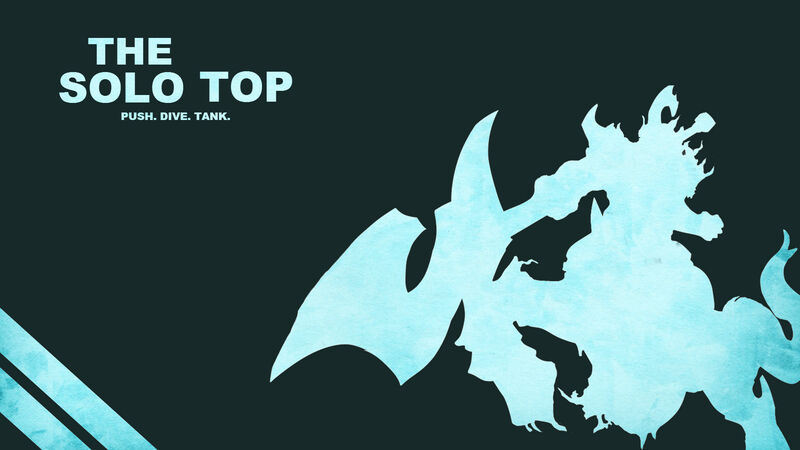 Learn how to tank and engage the enemy team in fights. Learn how to push, farm and harass – Unlike bottom lane, you do not have a support. Top lane isn’t as mechanically intense since you’ll be focusing on farming. However, like mid lane, you’ll have to include dealing with harass, harassing the enemy laner and learning when to go for a kill in the laning phase without dying given the enemy laner’s champion crowd control, skill cooldowns, damage, summoner spells, and if you’ll have to dive enemy tower if diving. All while paying attention to if the enemy jungler is around; this is vital because the top lane stretches in an arc so if you cross the river, you’re essentially committing to what you crossed the river for. So top lane, like mid lane, is more about variables to consider then mechanics (although you’ll need those to play well in lane) and a sixth sense (and ward coverage) of the enemy jungler when crossing the river. Blade of The Ruined King – This is usually a pick up for Solo Top for the 1v1 potential or split pushing. The active heal, attack speed buff and enemy slow really can help in some situations. Ravenous Hydra – A good Attack damage item that helps with wave clearing with it’s AoE active and passive. The Black Cleaver – A good item to help shred armor and also provides health and cooldown reduction. Summoner Skills that I generally use are Flash and Teleport to stay safe and for surprise ganks or to join team fights respectively. Sometimes I’ll use Exhaust or Ignite if it fits the lane situation or the team composition. Sometimes Ghost is good option. 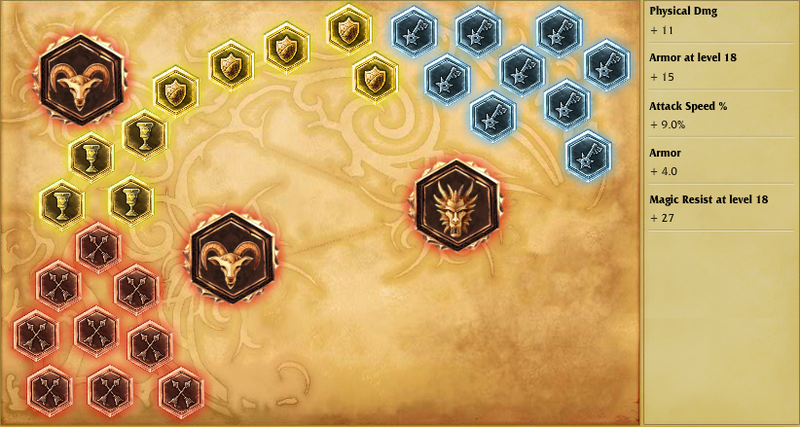 Masteries are 9/21/0 focusing on a bit of damage in the offensive tree and massive defense the defense tree. 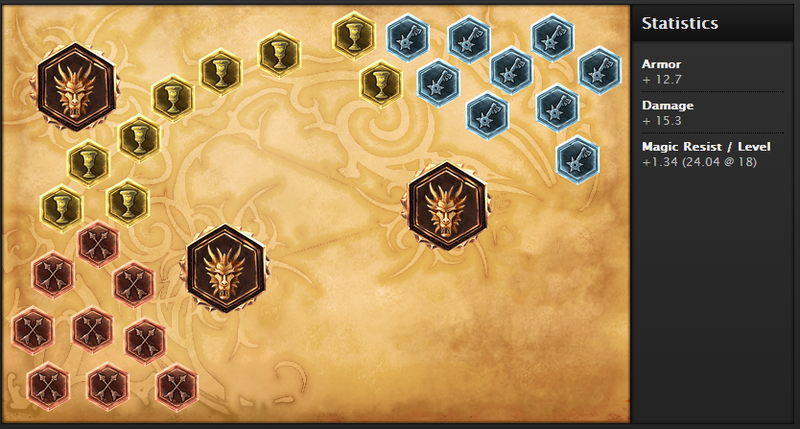 If you take a carry to the top lane, you may want to focus more in the offense tree. Runes are usually standard damage marks and quins, armor seals and magic resist glyphs. Sometimes I opt to swap the AD marks for some armor pen or swap the AD quins for more armor. Of course if you clearly have an advantage over your enemy laner, you can feel free to take them out. At the same time, do not get baited. You can get easily killed if you go too far out into the lane. Once you’ve cross to the enemy’s side of the river and you don’t know where the enemy jungler is or if someone in the other lanes are missing, you essentially taking a risk at that point. Be sure to place at least a ward in the river and if possible your side of the lane brush. To be completely safe, use 2 wards. One for the enemy jungler’s likely entrance to gank you and one for the river or lane brush. Essentially you can’t dive a champion if you’re low on health and mana or are missing vital skills needed to dive successfully. You’ll also need an exit strategy if the dive fails and you’ll also need to make sure that the enemy team isn’t nearby if it’s a gank to ruin the dive and get a kill off of you. If diving a turret, making sure you can survive the hits from the turret. Having a minion wave taking the turret hits while you dive will increase the odds of a kill since the turret will only focus on you when you actually land a hit on the enemy champion. Having your jungler or mid laner come help out during the laning phase also increases the chances of a kill. Diving an enemy team should be done when you take advantage of a mistake they made or if you’re engaging by surprise. In team fights, you are the front line. You may have your jungler or support (if they’re tanky) helping you out. You’re the one who soaks up damage while dishing out damage to the front line while you’re team deals damage to the front and back as much as possible. The goal of this is to make the enemy team waste their good skills on you so that they’re on cooldown while your team uses their skills on high priority targets. When the enemy team thins out a bit or if you get the chance, you can go for the high priority targets to take out provided your teammates will be ok versus the enemy front line. You might die given you’re in front but if you’re protecting your teammates will dishing out damage or just being an annoyance, then your team will usually come out on top. What I like to do is initiate on the team then immediately try to jump onto a carry and hammer away at them. This forces the whole enemy team’s attention and focus fire on me while my team does damage. So those are the general guidelines on how to play as a Solo Top. Essentially you are the vanguard. If the enemy team finds you scary to get past by, your doing your job. As always, feel free to comment below if you have anything to say about the guide. Have fun on the Fields of Justice! You have to learn every role – It doesn’t matter how good you are in one role, you need to learn how to play fairly decently in every lane. You don’t have to be amazing at every role, your team in most cases should help make up for that. You will eventually have to play in Top lane – It’s not often that you’ll be forced to play Top lane but you’ll have to play it sooner or later. Better to learn it soon and be fairly decent then be crap because you’ve never tried it. Learn how to push, farm and harass – Unlike bottom lane, you do not have a support. Top lane isn’t as mechanically intense since you’ll be focusing on farming. However, you’ll have to include dealing with harass, harassing the enemy laner and learning when to go for a kill in the laning phase without dying given the enemy laner’s champion crowd control, skill cooldowns, damage, summoner spells, and if you’ll have to dive enemy tower if diving. All while paying attention to if the enemy jungler is around; this is vital because the top lane stretches in an arc so if you cross the river, you’re essentially committing to what you crossed the river for. So top lane, like, is more about variables to consider then mechanics (although you’ll need those to play well in lane) and a sixth sense (and ward coverage) of the enemy jungler when crossing the river. Doran’s Shield – An item that give the champion health and health regen. It also blocks a bit of damage from basic attacks. Thornmail – An item that gives the champion armor and returns a percentage of basic attack damage when hit by an enemy champion. Warmog’s Armor – An item that gives the champion health and percentage health regen based on the champion’s maximum health. The Brutalizer – An item that gives the champion attack damage, armor penetration and cooldown reduction. Sunfire Cape – Gives the champion armor and health and deals magic damage to surrounding enemies. Frozen Mallet – Gives the champion health, attack damage and slows enemy champions when hit by the champion’s basic attack. Maw of Malmortius – Gives the champion attack damage, magic resist, a shield against magic resist when low on health and attack damage based on a small percentage of the champion’s missing health. Randuin’s Omen – Gives the champion health, armor, reduction of an enemy’s attack speed, and when activated, slows surrounding enemies based on the champion’s armor and magic resist. Spirit Visage – Gives the champion health, magic resist, cooldown reduction, health regen and increases the rate of self healing, health regen, lifesteal and spell vamp. Frozen Heart – Gives the champion armor, mana and cooldown reduction. It also reduces the attack speed of surrounding enemy champions. Locket of the Iron Solari – Gives the champion health, armor, cooldown reduction, an aura that gives ally champions magic resist and health regen and when activated, gives surrounding ally champions a shield based on the champion’s level. Summoner Skills that I generally use are Flash and Ignite to stay safe and to secure kills respectably. Sometimes I’ll use Exhaust or Teleport if it fits the lane situation or the team composition. Sometimes Ghost is good option for champions like Vladimir. 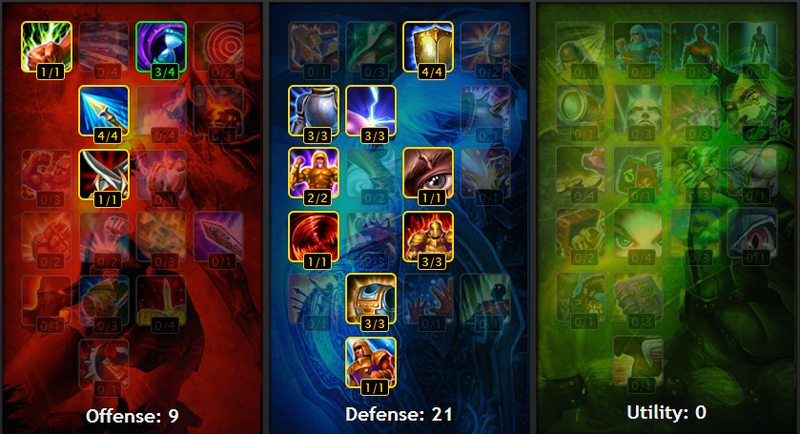 Masteries are 9/21/0 focusing on abit of damage in the offensive tree and massive defense the defense tree . For my masteries I use Flat Armor Seals to mitigate the lane damage from enemy champion, minions, enemy jungler and turret (if you go for a dive). Scaling Magic Resist Glyphs to mitigate damage and Flat Attack Damage Marks and Quintessences for damage. Sometimes I might swap the marks out for Flat Armor Penetration ones. Of course if you clearly have an advantage over your enemy laner, you can feel free to take them out. At the same time, do not get baited. You can get easily killed if you go too far out into the lane. 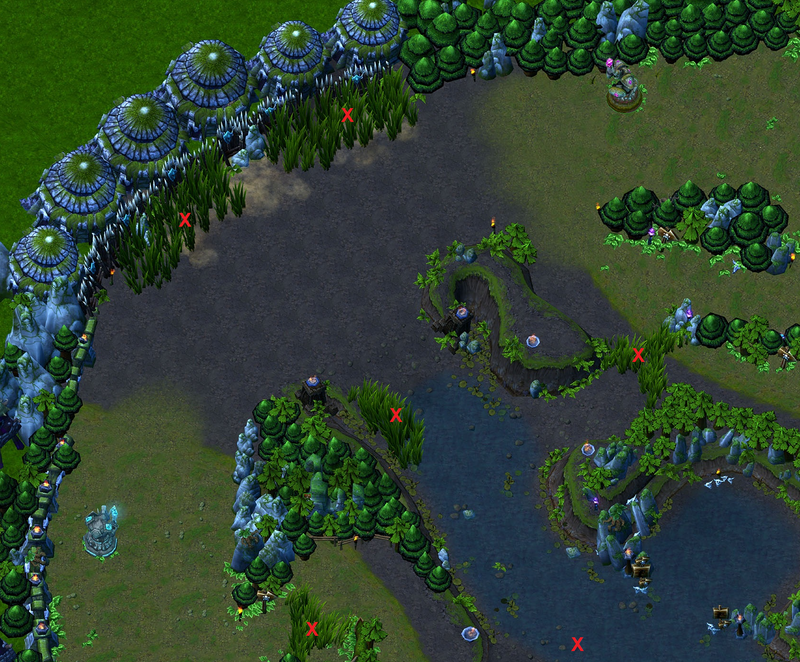 Once you’ve cross to the enemy’s side of the river and you don’t know where the enemy jungler is or if someone in the other lanes are missing, you essentially taking a risk at that point. Be sure to place at least a ward in the river and if possible your side of the lane brush. 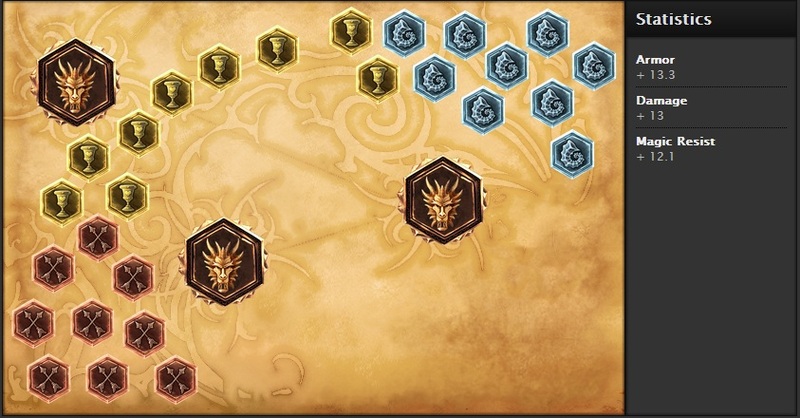 The image above shows some decent places to ward depending on what side of the map you’re on. To be completely safe, use 2 wards. One for the enemy jungler’s likely entrance to gank you and one for the river or lane brush. Essentially you can’t dive a champion if you’re low on health and mana or are missing vital skills needed to dive successfully. You’ll also need an exit strategy if the dive fails and you’ll also need to make sure that the enemy team isn’t nearby to ruin the dive and get a kill off of you. IF diving a turret, making sure you can survive the hits from the turret. Having a minion wave taking the turret hits while you dive will increase the odds of a kill since the turret will only focus on you when you actually land a hit on the enemy champion. Having your jungler or mid laner come help out also increases the chances of a kill. In team fights, you are the front line. You may have your jungler or support (if they’re tanky) helping you out. You’re the one who soaks up damage while dishing out damage to the front line while you’re team deals damage to the front and back as much as possible. The goal of this is to make the enemy team waste their good skills on you so that they’re on cooldown while your team uses their skills on high priority targets. When the enemy team thins out a bit or if you get the chance, you can go for the high priority targets to take out provided your teammates will be ok versus the enemy front line. You might die given you’re in front but if you’re protecting your teammates will dishing out damage or just being an annoyance, then your team will usually come out on top. So those are the general guidelines on how to play as a Solo Top. Essentially you are the vanguard. If the enemy team finds you scary to get past by, your doing your job. As always, feel free to comment below or hit me up on twitter if you have anything to say about the guide. Have fun on the Fields of Justice!